What's wrong with Harry Reid? My youngest teenager still likes to go out trick or treating. He is on that fence between wanting to be a kid and wanting to be grown up. His costume was a bedraggled-hair wig...period. 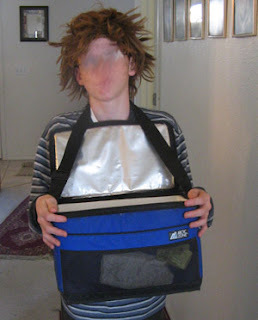 He carried a small cooler with the strap around his neck. Rather than say, "Trick or Treat." His plan was to say, "donations!! ?, donations!!?" We let him go out anyway because he was taking a couple of the younger boys with him. ...at least he didn't come back with a pillow case full of candy like some of our other kids. ours are 15 and 16 and gave up halloween eight years ago due to reasons of faith - no, we're not jehova witlesses! i still buy several bags of assorted candy and put it in a large bowl on the counter for all to have throughout the month. Nanc, I can understand your reason for abstaining from Halloween. It isn't exactly a very HOLY holiday. I don't like my kids to dress up in bloody and gorey costumes. For them it is just a fun day to dress up and get candy. ON a side note to this: we don't give out Easter baskets ON Easter. WE do the eggs and baskets the day before so that we can focus on the real meaning of that day ON Easter. Starla, the choices for it were limited...in fact I didn't add a LOT of songs that I like...as I said, it was a sample. you and brooke and your buble! give my regards to the veterans in your family, kelly. hey we got our house!!! It has a pool! I'll post pictures on my blog soon. I always hand out something like a single dum-dum or smarty to an un-costumed teen, and I make sure to give something really good to the little ones right in front of 'em. What a novel idea...giving a cheap little piece of candy to an uncostumed teenager. he he he he!